Having what you need in your kitchen is a pretty important matter when you transition to the WFPBD (whole food plant-based diet). What’s in yours? For those starting out on this wonderful journey, here are some tips that are worth repeating. It’s quite possible to make entire meals out of what’s in your pantry. Coming home from a long trip, work, whatever and having nothing in your fridge and nothing fresh readily available, you can still make a delicious meal from your store cupboard, especially when you need something quick and easy to satisfy your hunger pangs. Dry grains, wholemeal pasta, wholegrain brown/red/wild rice, quinoa, couscous, millet, wheat berries, buckwheat, spelt, oats. rye – the list goes on and on. Fill your pantry with as many different whole grains as you can find; they all can make a great basis for a meal. Potatoes, sweet potatoes, parsnips, swede, turnips, celeriac, mooli, squash, etc. Potatoes in particular are an excellent staple to store in profusion. I buy 25 kg bags at a time from a local farm shop. Potatoes can be pre-cooked and kept in the fridge or freezer. They are quick to microwave and can be eaten hot as a snack or the base of a meal – I even bake them in batches and then take them with me on journeys as quick snacks. 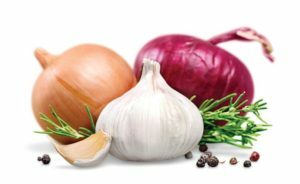 Again, I buy 25 kg sacks of onions – white or red varieties, and there are always lots of garlic bulbs lining shelves. I regularly throw a couple of onions in the microwave for a two to three minutes and then peel and add to meals. they can be sauteed, boiled or steamed really quickly, and they are always appearing in their raw state in salads. Garlic is added to as many meals as possible. 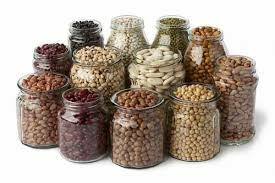 Dried beans and pulses of every sort fill jar upon jar in my pantry. They are so quick and easy to use – either having soaked them overnight or putting them with enough water straight into the pressure cooker without soaking. They only take minutes (check your pressure cooker user manual or look online for guidance with specific beans). When ready, they form the ideal basis for a meal, or simply add a bit of spice, herbs, nutritional yeast, vinegar or non-salt sauces or eat them one their own as a quick and filling snack. 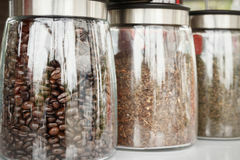 It’s also worth keeping some tins, jars or tetra-paks of ready-cooked beans for times when you are really in a rush. Just make sure they either have no or just a little salt added. Even tins of low-sugar/salt baked beans will fit the bill if you have no time for anything else. Making your own bread, muffins, the occasional cake etc is not only cost-saving, it is always going to be the healthier option compared with the bast majority of commercially-prepared versions. Try out every type of wholemeal (always wholemeal) flours that you can find – kamut, einkorn, emmer, spelt, rye, bulgar – so many with which to experiment. There are loads of herbs and spices that you can keep in your pantry. Onion powder and garlic powder are really handy to keep available. Cumin, smoked paprika and black pepper get into most meals one way or another. Fresh herbs in pots and dried herbs in jars. Italian spices, Indian spices, Chinese spices, Caribbean spices, spices you bought, spice mixes you pre-prepared. 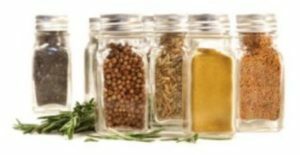 Whenever you come across a herb or spice that you don’t have, buy it, put it in an attractive labelled jar and experiment with it – there will always be WFPB recipe ideas on the internet to use with it. Tinned vegetables and fruits can be really convenient. Try to avoid those that have added salt or sugar – especially those fruits that are in syrup. As a basis for a main course, dessert or just as a snack straight from the tin, it is better to know that you have these in reserve for times when you need to eat quickly but don’t have enough time to prepare a meal from fresh. 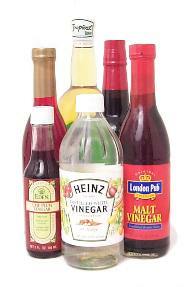 There are lots of different vinegars that you can use to spice up any meal – balsamic, red/white wine, cider, sherry, rice, champagne, malt, white. Again, few meals manage to get eaten without some vinegar or other being involved. Lovely on a baked/microwaved potato or with nutritional yeast over gently cooked kale or cabbage. There are a huge number of interesting mustards available – classic yellow, Dijon, spicy brown, Pinot Noir, English, German, Chinese, balsamic, stout beer, habanero. My favourite is whole grain. I get through so much of it that I usually buy three at a time. Mustard jazzes up almost any meal – from complex stews to simple plates of beans, rice and dark leafy greens. Garlic, chilli, fruity, tomato salsas – whether mild to inferno level, these add such character to meals. Check that the varieties you buy have as low sugar, salt and oil added as possible. 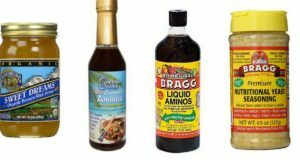 Liquid or coconut aminos is useful to have around. I buy nutritional yeast in bulk and goes into almost everything I cook. of course, you can simply make some of your special sauces and flavourings. Whilst the fruit of bananas seems to last a lot longer in the fridge without turning black, expect the skins to go black a lot sooner than if they are kept outside of the fridge. Tomatoes are best kept out of the fridge in order to maintain their flavour, but mushrooms, green beans, mangetout, radish, celery etc seem to last better when kept in the fridge. Leafy greens – lettuce, kale, chard, rocket, watercress, spinach, broccoli, cabbage etc – last longer and retain more of their nutrients when kept in the fridge. It’s claimed that the best way to store them in the fridge is to wrap them gently in a damp paper towel or a damp towel. They’ll then stay nice and crisp. This is a similar principle to the water-spraying systems next to fresh fruit and veg you may have seen in certain supermarkets. Delicate fruits like grapes, apricots, fresh berries do better when refrigerated, while many others – peaches, apples, oranges, pears, peaches, lemons, limes etc – can stay outside the fridge. There are so many plant milks available now. If you are like me, you will enjoy making your own (see here) and these will obviously need to be refrigerated. Commercially-prepared varieties mostly appear to be UHT, so they don’t need keeping in the fridge unless they have been opened. Same goes with any home-made vegetable juices or cartons of commercially-made tomato juice – another essential thing to have hanging around – once they are opened. 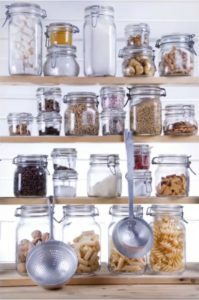 There’s usually a dozen or so open jars or containers in my fridge – miso, tomato salsa, hummus (usually home-made), pickles, relishes – they are sitting there ready for adding to meals whenever needed. You want to open your fridge and see the rainbow! Most ready-prepared frozen veg and fruit you buy is already washed and pre-cut for you. It makes life so easy. And it’s more affordable. So it’s a win-win. You can buy ready-cooked brown rice or freeze your own in portions and quickly heat up in the microwave or on the stove. You can freeze healthy home-made breads, cookies, muffins, and all those delicious home-made desserts so that they can be ready for you within minutes. Some people recommend keeping other foods in the freezer, including nuts and seeds, flours and nutritional yeast. Leftovers and meals precooked in batches are ideal for storage in the freezer. Soups freeze well in in individual portions. I also make lots of vegetable broth from both the vegetable scraps used during the week and the water I reuse to boil veg. This can be put into one cup portions or in ice cube trays, ready for when you need a quick stock as a basis for a meal. A couple of stock ice cubes are great for starting off sauteed veg in a wok or frying pan. Tofu freezes well and it changes into a sort of ground beef consistency. So, if you’re looking to replace ground beef in some of your family’s old favourite meals, chilli or tacos, for instance, this is something worth trying out. 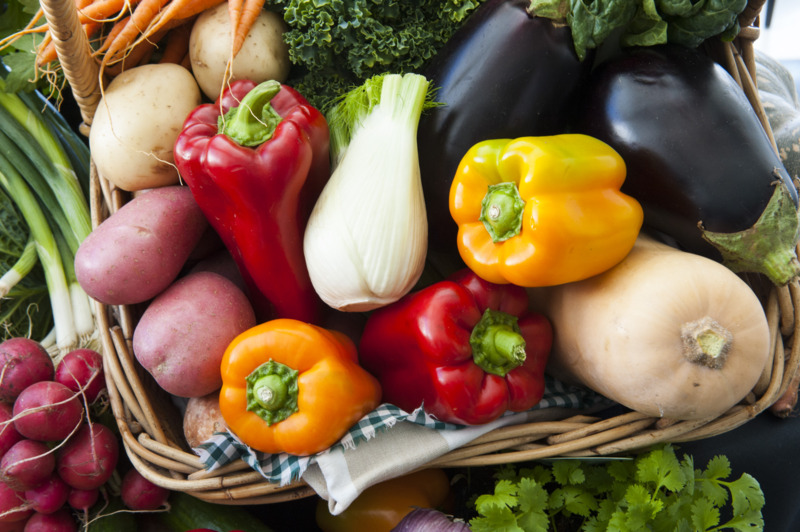 If you come across a load of veg or fruit for sale, it is probably possible to freeze from fresh or after cooking. I do this with apples when they are freely available from friends and family – boil, puree and freeze. Apple sauce is excellent as a base for so many meals and desserts. Even things like capsicum (bell) peppers and chilli pepper freeze well. During the summer months when strawberries and other berries are plentiful and cheap, it’s an ideal to pile loads into the freezer. And if you don’t have enough room for individual fruits, blend them up and keep them as a berry sauce for future use. 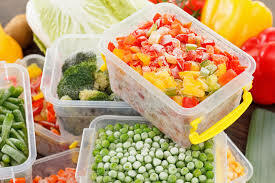 Finally, whenever you come across reduced-price fresh vegetables or fruit, it’s worth considering buying in bulk and either putting straight in the freezer or cooking/preparing them and then freezing them. Starting out on this wonderful WFPB journey can be fun as well as optimally healthy. 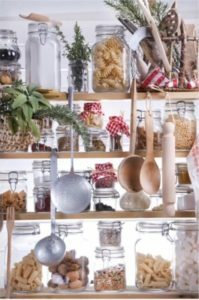 Why not make it a personal challenge to have the best stocked WFPB kitchen in town!